Please Note: We will be closed from 12/22/18 through 1/1/19. All orders placed between 12/22/18 and 1/1/19 will be processed and shipped when we return on 1/2/19. 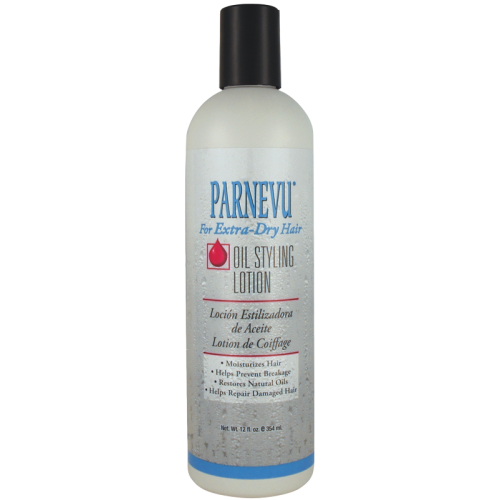 PARNEVU Extra Dry Oil Styling Lotion is specially formulated with Vitamin E and the finest natural oils to protect, condition, and moisturize your hair. It absorbs into hair, replacing vital moisture lost due to chemical damage and everyday styling. Use it every time you style your hair to maintain your hair's natural moisture level and manageability. Directions for Use. Shake well before use. Squeeze lotion into the palm of your hand. Rub hands together and massage through hair into scalp. Style as desired. Size: 12 fl. oz / 354 ml. INGREDIENTS: Water (Aqua, Eau), Mineral Oil (Paraffinum Liquidum, Huile minerale), Beeswax (Cera Alba, Cire d'abeille), Petrolatum, Lanolin, Sorbitan Stearate, Sodium Borate, Sodium PCA, Sodium Lactate, Arginine, Aspartic Acid, PCA, Glycine, Alanine, Serine, Valine, Proline, Threonine, Isoleucine, Histidine, Phenylalanine, Fragrance (Parfum), Propylene, Glycol, Methylparaben, Propylparaben, DMDM Hydantoin, Red 33 (CI 17200).